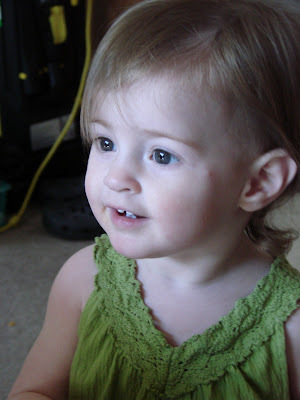 This is Isabella at 1 year old. She is so smart and keeps everyone hopping just to keep her safe. She loves to climb and can figure out how to get just about anywhere. That activity level is much like her Dad's at the same level so I can understand what a handful she must be. She has a real developed sense of humor. She takes the paper into her great Grandpa every evening and will hand it to him and then jerk it away and laugh. I am having trouble with muscle spasms every morning...again! If I take the muscle relaxers they take the pain/spasms away but then they make me so sleepy that I'm no good for the rest of the day! I have been trying to get a layout done for the design team for about 3 weeks. I will start to work on it and the next thing I'm sleeping with my head on the table! My day on Thursday was quite exciting compared to most of my days! I had tried to get a MRI at Elkhart General about 2 weeks ago but the pain was too bad and I couldn't hold still enough for a scan. So, yesterday I went to Memorial Hospital that happens to be the only hospital that will put a person like myself under general anesthetic for a MRI. The bad news....I have known for quite some time that I have pulmonary hypetension. I thought things were better since I cant really see my lungs. So, if you can't see it and you can't feel it, you must be all right, right? WRONG!! That was my lesson of the day. The good news....I asked him (the anestheologist) to please tell me when he puts the medicine in my IV to which I heard a little snicker and then my hand began to burn so I knew it was going in. I said..."my hand is really burning bad"....and that's that last I knew until I was in the recovery room. The bad news... I should have kept taking the medicine for the pulmonary hypertension. I don't remember it but Wayne could hear the doctor and nurse say Becky, you need to take a deep breath. Becky, please take a breath... Wayne heard the nurse telling me for quite some I needed to sit down. Then he heard the doctor say that I could go ahead and sit up if that felt better. Wayne said when we came out of the MRI center that the doctor had his arm around me to help me sit up. When I met the doctor to begin with he told me that he has some very light twinges in his back and can really feel for someone like me who has pain all the time. So, that's probably why he was so understanding. The good news... It is now 5:00 in the morning. I am still breathing...yeah!! My Mom is taking me to the pain center first thing in the morning to make sure my pump didn't get turned off during the MRI. I'm feeling pretty good but I don't know for sure what my symptoms would be and how long it it would take to feel the effects of the stopped pump. I took this pictue of Isabella about a week ago. She is one year old! 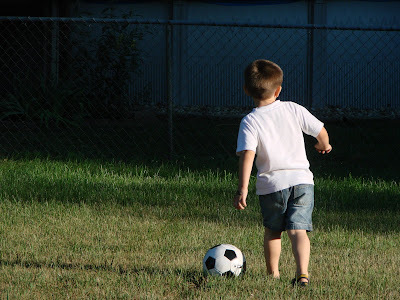 After a 2 day-10-12 hour drive from Memphis Jacob felt like going outside and kicking a ball around with Grandpa Wayne. 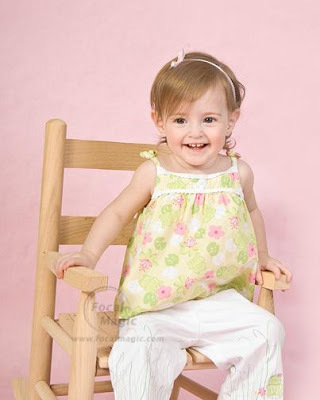 T This picture was taken of Isabella by a professional photographer for her year old pictures! I can't believe that little baby is a year old all ready! Kristi and Jacob arrived here safely from Memphis. This is the first time she has driven here and got along just fine. They were going to take the train and found a great price. When she went to book it the pr ice had almost doubled! Today was the first day without muscle spasms. I read over my entry from a day ago and couldn't believe how many mistakes there were. I guess that's what happens when I'm in pain and on the muscle relaxers. They relax the muscles AND they relax me too. Well, I thought I had these muscle spasms under control and then yesterday (Sunday) I had them all day long no matter what I took or what I did. It was so discouraging. I was even getting some scrapbooking done the day before and try as I might I couldn't continue on Sunday. I had to cocmpletely redo the scrapbook page above....the picture was crooked and it threw off the look of everything. I am very pleased with the look now. I tried to scrapbook today but kept falling asleep from the anti-seizure medication and even got an imprint from my on my face from my "Cricut" machine from falling asleep and my face ending my on the machine. Now, it Monday morning and I am fine...so far! I'm just cringing thinking that they might start soon any time. 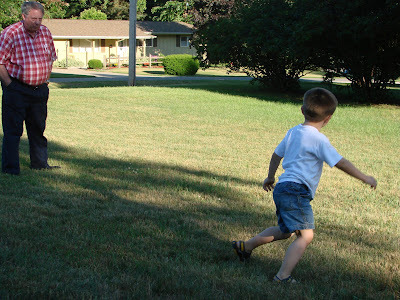 Steve, Katie and Tyler and Caden spent the weekend at the campgrounds. We have our motorhome parked there for them and they help with the maintenance while it's there. If we're not driving it, someone may as well be getting some good out of it. Well, Steve & Katie have no goo place to ride a bike at their house so while they were there, Tyler learned how to ride a 2-wheel bike. I guess he just took off in his bike!! He had forgotten his transformers blanker that he sleeps with at my Mom & Dad's house and my mom left it here for him. He was so glad to see his blanket that he told his mom "that really lifted me down" to get my blanket. How cute! !